Some of the first sprouts to emerge in the spring swamp are usually skunk cabbage. They first appear looking like dinosaur claws, or teeth, poking up through the mud. They unfurl a protected leaf that cups a bizarre flower, and later, as the weather warms, the rest of the large broad leaves quickly develop. They get their name from the smell given off when crushed or stepped on. Some would find it unpleasant, but after a long cold sterile winter, the smell says nothing but 'spring is here' to me. The project began simply, with a cube. A bit of experimentation with various shaders, and a render was made from a top view. This render was brought into tSExtruder, and used to produce the ground object. The grass was produced by the Hairplug tsx. I first drew a smooth organic random shape with a spline, and converted it to a polygon, which was then swept. Next, pop up a cube, and quad divide it several times. Position it over the swept polygon, and in the boolean options uncheck 'delete edges', then boolean subtract the cube from the polygon. Select the bottom face, and delete vertices. The resulting object was run thru Hairplug tsx. I made 3 of these clumps, and positioned them on the ground object. At the suggestion of Rob Mitchell, I SS'ed the large clump of grass; I think it helped soften and give a much more organic look to what had been a somewhat stiff, sharp model. 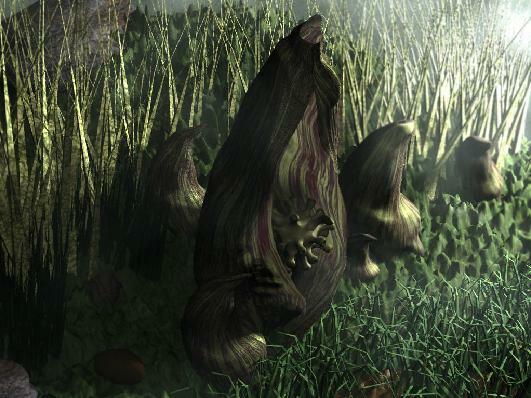 Next up was the skunk cabbage itself, and for these I used NURBS. It was a fairly straightforward process starting with a half cylinder and extruding from there, pushing and pulling points and lines. For the flower, a stock geosphere was point edited, sweeping various faces out, then in a bit at each tip. A stalk was swept off the bottom, and the whole thing run thru Subdivision Surfaces with a resolution of 2. A variety of rocks and pebbles were made with Sub Surf, and positioned in/on the ground. Next up was a paint job, which proved to be the hardest part. Many experiments with translucency and a texture produced from a scan of an actual skunk cabbage were made. It finally came to life after running the leaf thru CP4's Slide tsx, to produce an outer skin for the nurb leaf. Compared to the leaf, everything else was a snap to surface. Lighting was next, and also took some experimentation. Volumetric of course, I had fun trying the different models, finally settling on the Mie Murky with a turbulent density shader. Starting with a spotlight, I switched to a shadowcasting area light for the key, and an infinite for the fill light. I was especially trying to catch the shadow of the spiky flower, and getting that translucent glow on the inside of the leaf. Many light colors were tried before I chose a gray key and a greenish fill. Also uses Yamaneko Depth post processing. .Scene stats: 485118 faces; 11,125 KB scene file size. Render times were quite speedy with the spotlight- under 30 minutes; with the area light it was considerably longer but with much nicer results. About 13 full renders, many unsaved area renders. Scene modeling and layout took about 5 days, lighting and surfacing another 10. -Enjoy!